Auburn is a college that cranks out quality runningbacks. 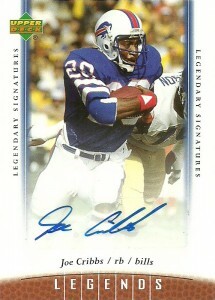 Among them Joe Cribbs, was a second round pick of the Buffalo Bills in 1980. He’d get the starting nod on offense for the team, and end up running away with NFL rookie of the year honors after a banner season, rushing for 1185 yards and 11 touchdowns. Cribbs earned a ProBowl nod after the season. Cribbs earned another ProBowl nomination for his 1981 season rushing for 1097 yards. A strike shortened 1982 limited Joe to only 633 yards, but he’d lead the league with a 90.4 yard average per game. His final Pro Bowl season in 1984, saw him rack up 1131 yards on the ground. Well in 1984 Cribbs decided to hop ship for the new USFL, which led to an infamous trial in Buffalo, where head coach Kay Stephenson claimed that Joe was not replaceable in the team’s lineup. Cribbs ended up winning, despite the Bills’ claims of first refusal on the contract, and played for Birmingham Stallions for the next 3 seasons till the USFL imploded. Returning to the NFL in 1986 Joe played for the 49ers through 1987, then played his final season split between the Dolphins and Colts in 1988. After football Cribbs returned to Alabama, where he went into financial advising. He currently assists many players with the reality of retirement and investing. He also has been involved with the AAFL (Team Alabama), and the United National Gridiron League.